Program 306 – Elder Wisdom | Wisdom of the Elders, Inc.
Adeline Miller remembers a time where people made the things they needed – and stories were shared by elders, not a tv or movie screen. 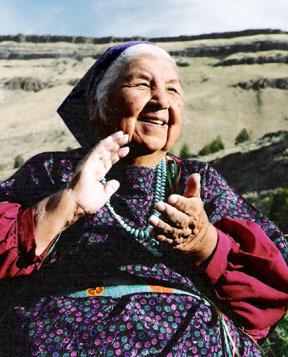 Born of Warm Springs, yakama, klickitat and paiute stock, Miller recalls her rustic childhood in the pine forests and sage covered hills between the Cascades and Deschutes River valleys. Some of these old ladies in their time, they say, “I got a basket for her. I got a bag for her.” One old man gave me a cow. Today I pass that teaching on, to always share with the elders. Remember them, because they aren’t going to be with us forever, because if it wasn’t for them you wouldn’t learn anything. You wouldn’t know what, what to expect in life. I was very fortunate to live with grandmother to learn all this. She’d always tell us to share. Not be mean to one another. It was our sisters. Take care of one another. One day one of these will be gone, you’ll miss her. She prepared us for all of that. And that’s why I always say she was a great teacher. And this is where most of my knowledge I learned from her and I remember. Huckleberries just before the Huckleberry Feast and picking. July 2003. Photograph: Rodney Frey. Courtesy Lewis and Clark Rediscovery Project. Miller learned of her people’s four feasts from her relatives. Each happens at a certain time of year when a particular food is ready for gathering. The celery feast is first, followed by the root feast, then the salmon feast. 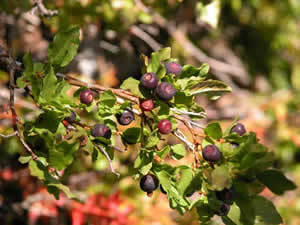 By late summer, it’s time for the huckleberry feast. So the huckleberries is the last. We have to take a taste of each of these foods. Then when we’re all through then they say, “Okay, drink your water.” Then you can eat all you can want. That goes on at any feast, and also at funerals they have this last meal with the person lying in state. They wear their traditional, the basket hat or, or the woven hats. So water holds a very special meaning to us. We’re giving our thanks to the Creator for giving us water, for giving us life. If it was not for water, we’d have no game, meat. We’d have no fish in the rivers. We’d have no plants for our berries. We’d have no roots in the ground. So this is why we always thank the Creator for our water by drinking water before each meal. Retiring in 1991, she finds herself busier than ever. Right now I work with the language. I help early childhood school by going over there singing song or recording songs for them and teaching dances. So I feel that to teach them at a young age they know who they are, to be proud that they’re Indian people, that they’ll never be anything other than that. One little girl come in and she says that she wasn’t Indian. Says, “Nice peoples are Indian and I’m not Indian.” “Well, why do you say that?” “Because I’m not Indian.” “Yes, you’re an Indian.” “Well, your skin is dark and look at mine.” “That don’t mean you’re not an Indian. You’re still Indian.” “I am?” That little child was thrilled that she was an Indian. It’s my reason for sticking with the children all the time. So when they ask me, I always try to be there for them. And some of the things that I shared with them was, when you comb their hair in the mornings, do not throw their hair away. They keep that. So that every hair you take off of that comb, you have them put it away where they want to keep that hair. Give them a drink of water before each meal. Always greet them with a friendly face. Or maybe a pat on the hand or shoulder or something like that, they know you mean well. You say you limit two people to come into your visiting if they’re really sick. My people, they want everybody there even if it’s standing room only. I says, “They feel good about that. That’s their way.” They want to pray, they have a song. Maybe you hear them singing in that hospital. They’re asking for prayer in songs. So, I made them understand how important that was to them. Miller says by caring for elders, sharing knowledge with youngsters, and being generous with everyone, people can live full and happy lives. It’s what keeps her traditions alive, and her spirits high. For Wisdom of the Elders, I’m Brian Bull.